Thank you Kimberly Richard owner of The Bridal Studio & Spa and Andrea Davis of Hair by Andrea Davis for the amazing job you did with my 17 year old daughter. This was her first photo shoot with Pedro Blanco Photography and they made her feel so comfortable. They created a beautiful face and hair style that was both true to herself and very fun as the shoot went on. I can not recommend this DREAM TEAM enough and hope that we can use them again in the near future. Kim was amazing for my wedding day! I felt beautiful and timeless and finally relaxed when I was with her. Highly recommend! I went to see Kimberley's associate, Melissa Gates, for a professional make up appointment. I was beyond inpressed with Melissa's talent, advice, and kindness. It was very kind of Kimberley to not only invite me into her home but like her lovely associate, she was beyond kind, generous, and I am hoping to come back soon to attend some classes. Absolutely incredible!!! Had such an amazing time and looked fantastic!! Cannot wait to come back! OMG ... Love love my lashes by Kim Richard... Been going to Kim for 4 years now and am never disappointed... Love her new private in home studio, so welcoming and relaxing ... Guys it's a MUST ... Check it out! I met with Kim and her hair stylist Andrea over the weekend for my wedding hair and makeup trial and I couldn't be happier with my choice. Kim was so easy to talk to, and great to work with, constantly asking questions to make sure I was happy with the progress and result the entire time. She literally took my vision of bridal makeup and emulated it perfectly. Andrea is an amazing hair stylist, I showed her one picture on Pinterest and she made it happen beautifully and effortlessly. I have had my makeup and hair done many times for formal events, and as a bridesmaid before and I have never been happy with my results. So impressed! I can't wait for my wedding day, thank you both! Kimberly and Andrea did an outstanding job preparing us for our photo shoot! They are experts at what they do and made us look incredible for the entire day all while having fun doing it. Thank you ladies!!! Kimberly is one of the kindest, most sincerely caring people I have ever met. She will not stop untl she knows you are completely satisfied and truly cares about her clients. Her soothing manner made me instantly relax and put me at ease. I wouldn't ever think about using anyone else! Not to mention, that her skills and those of her staff are far and away superior to any other I have utilized. You can't go wrong with Kim! Such a talented woman! Skill and pampering is top notch! I highly recommend for facials. Thank you Kim! Kimberly was absolutely amazing. Not only did she make me look flawless for my wedding but she is SO much fun, professional, amazing at her craft and helps put the mood in the room at ease. It was absolutely one of the best decisions and money that I decided to spend on myself for the day. If you are thinking twice about hiring Kimberly… don't! You will not regret it! I was married on September 20th and was fortunate enough to be able to secure Kimberly Richard’s team of miracle workers! She was highly recommended and she has been giving me the best facial treatments since moving back to Cape Cod! I had family and friends in my party, both young and young at heart, and her team of cosmetic specialists did more than work their magic! A special thank you to Erin Marconi and Regina who simply have the magic touch! Erin is fabulous by the way and not just because she has a king Charles cocker spaniel like us too! All the girls enjoyed the pampering and pop of color on the lip! You made us all, including my man, look like a million bucks! My dear friend Megan even called the next day to say that her boys didn’t even recognize her from the picture she took at the wedding because she looked so glamorous! Here’s to kind hearts, professionalism, a little magic and to glam squads! Kim was an absolute pleasure to work with! She made me feel so beautiful on my very special day. I cant wait to work with her some more. She is amazing! Kim and Michelle you did an amazing job! Thank you for everything!! Thank you, Kim, for giving me a crash-course on applying my own makeup. I feel so much more confident doing my own bridal makeup now, and learned so much. 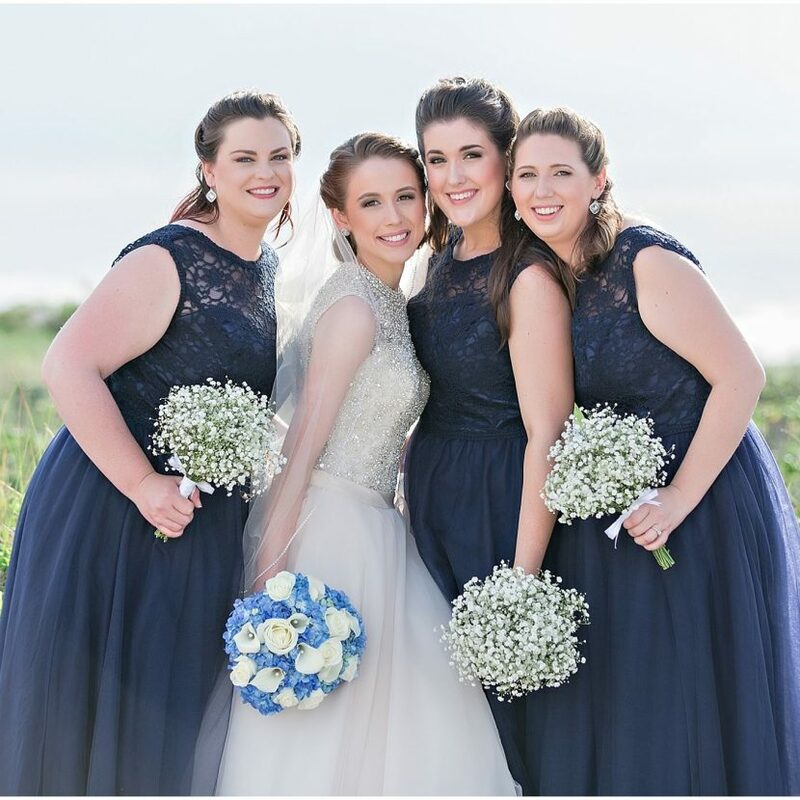 I highly recommend Kim's makeup lessons--for brides-to-be or anyone who wants to learn some professional techniques and get product recommendations from an expert. Fabulous!